“Simon Says” has the unfortunate task of following “Arrhythmia,” perhaps the show’s greatest episode thus far. It doesn’t help that, like “Arrhythmia,” its central plotline once again incorporates a “ticking clock” element that feels a tad déjà vu for my taste. As a matter of fact, by the time the episode reaches the climax, it has two ticking clocks running simultaneously. But before we get to the negative—let me praise a twist that I actually enjoyed. In an attempt to cut down on the precinct’s energy usage, Dorian is not given his proper power-up for the day. His reaction is akin to that of a coffee addict who has been denied their daily caffeine dose. He’s antsy, grumpy and prone to sporadic word vomit. It’s a nice callback to the pilot episode, which pointed out that his model was discontinued due to its erratic behavior. In any case, not only does Dorian’s condition lead to several humorous bits, it also effectively adds a bit of tension to the proceedings since Kennex now finds his partner in a more compromised state. Now onto the episode’s baddie. Whereas last episode’s crimes were perpetrated by small group headed by a central mastermind, this week’s villain, Simon Lynch, is merely a single angry computer nerd with a power complex. Unable to find satisfaction in real life, he feeds his lust for attention by strapping timed explosives to people’s necks and streaming their struggle for survival as a live web broadcast. He’s essentially the Jigsaw killer from the Saw films meets a sleazy YouTube personality. 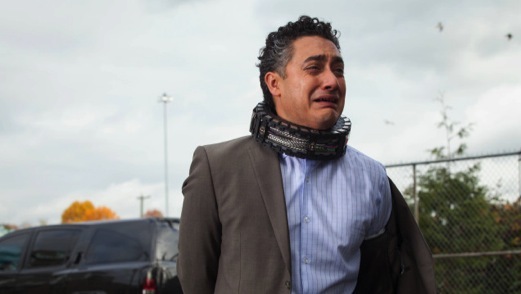 His first victim is a banker named Ramon, played by Battlestar Galactica alumnus Alessandro Juliani. Ramon is on the phone with his wife—a sure omen of death in this series—when he’s suddenly gassed by Lynch (disguised as a homeless car washer). He awakens to find an explosive attached to his neck and instructions for what to do if he wants to live. These instructions include robbing a bank and engaging cops in a high-speed pursuit. It’s later revealed that Ramon is a banker who denied Lynch a loan. Though Kennex and Dorian attempt to rescue him, they are too late to disable the bomb and are forced to place a miniature force-field around him to contain the explosion. While my lingering love for BSG made me wish Juliani’s character could have lasted a bit longer, I respected the unexpected route the writers decided to go. Kennex and Dorian’s failure to save Ramon demonstrates that, despite being the main characters, they are not superhumans (or super-robots) who can save everyone. Anyway, after Kennex and Dorian succeed at rescuing the second victim (a woman who’d turned down Lynch for a date), the infuriated geek proceeds to kidnap Kenenx and put him through the same trial. Here is where the aforementioned two ticking clocks come into play. In one corner, we have Kennex attempting to disarm the bomb around his neck while, in the other, Dorian rushes to disarm Lynch, who is standing on top of a nearby tower with a remote to the bomb in his hand. Adding to the tension is the fact that Dorian is running on his last bits of power. I get what the writers were going for, but the whole shebang, frankly, feels a bit like overkill. Perhaps I’m being a bit harsh on “Simon Says” in lieu of my raised expectations for the show following “Arrhythmia.” Still, having glimpsed the show’s potential for greatness, I feel the need to point out when it’s falling into familiar traps. Almost Human spent the first few episodes figuring out what kind of show it would be. Even now there’s still a feeling that the writers are trying to pin down the series they want to make via trial-and-error. Although it’d be harsh to classify “Simon Says” as a straight-up “error,” the episode does demonstrate a certain level of story recycling. And that, dear readers, would be the true error.